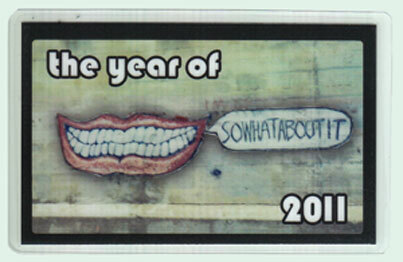 Today, you are a member of... 2011: The Year of SO WHAT ABOUT IT - You Are A Member! Consider your brain, members. Now imagine it’s an industrial wall somewhere off the banks of the Cuyahoga River – there’s a good chance it’s seen better days, but really, it’s a survivor. And consider this here new year, 2011. Now imagine said year is an anonymous grafitti artist that has just tagged you, enlived your urban sturdy survivalist self with something rather demanding and unusual, mutating your previously anonymous structure into a very distinct inquiry / statement. So be it, members, and so what about it – that’s the question and declaration for the next 365. Sure, setting off from the rest of the anonymous structures isn’t without risk, but it isn’t without profane glory either. So whereas the silence of brick and mortar won’t fly this year, your big mouth sure will. Put a little lung behind it and enjoy mouthing off in the new year.